I was informed of the death of the last Dominican bishop on the face of this earth, the Most Reverend Robert Fidelis McKenna, O.P., around 5:00 p.m., Eastern Standard Time, on Wednesday afternoon, December 16, 2015, the Feast of Saint Eusebius and the Commemoration of Ember Wednesday in Advent,nearly four hours after His Excellency had died at the age of eighty-eight years, five months, seven days. We were privileged to know and to be served by Bishop McKenna, who was one of the most truly humble, self-effacing men we have ever met, a true son of Saint Dominic de Guzman, the founder of the Order of Preachers to whom Our Lady gave her Most Holy Rosary. Indeed, Bishop McKenna preached often on the Holy Rosary and its efficacy, explaining that Our Lady’s Most Holy Rosary was her sword and her Brown Scapular was her shield. His love of Our Lady and his devotion to her Most Holy Rosary permeated everything he did as a priest of the Order of Preachers even well before he became the founding pastor of Our Lady of the Rosary Chapel in Monroe, Connecticut, offering the very first Mass in the former Stepney Methodist Church that had been purchased by Father Francis Fenton for the Orthodox Roman Catholic Movement on Sunday, January 21, 1973, a fact we learned on that date in 2008 when the Bishop talked about the milestone of the chapel’s thirty-fifth anniversary in his sermon at Holy Mass. Mere words can never do justice to describe Bishop McKenna’s great and tireless zeal for souls nor to fully communicate the true humility that he exhibited as he, a Successor of the Apostles who was consecrated by Bishop Guerard des Lauriers in Raveau, France, on August 22, 1986, the Feast of the Immaculate Heart of Mary, went about such chores as taking out the garbage or vacuuming the floor of his very small office. He made the following remark when I was startled by the fact that I had happened upon him in his office as he was vacuuming: “Doctor Tom, don’t make a virtue out of necessity.” He cracked just the slightest smile as he looked up at me and said this. Although I am under doctor’s orders to get rest as he says that my body still has another month or so to heal from hernia repair surgery seventeen days ago, I do want to relate two brief stories about the Bishop. The second is a story he himself told from the pulpit on Sunday, February 14, 2010, and it is worth repeating again even though I had included it on this site over seventy months ago now. Bishop McKenna began his story by saying that it had been fifty years ago that very day, February 14, that a Dominican priest in residence at Saint Catherine of Siena Priory on the East Side of Manhattan was awakened around 4:00 a.m. by explosions that sounded to him as though the Russians were bombing the City of New York. He got up and then knelt by his bedside to pray, thinking that the end was near. The priest got up from prayer to look out of his window to see that a nearby building was on fire. Flames were shooting from the top of the building. The priest then got dressed to go out to see if he was needed to administer the sacraments to anyone who might have been injured in the explosions, which he learned at the scene had been caused by exploding propane tanks on the top of what turned out to be a building under construction and thus unoccupied. The tanks were being shot up into the air before landing in the East River. After finding that his brother Dominican priests were already on the scene and that no one had been injured, the priest returned to sleep for a few hours. It was later in the evening of that day, at a time when it was pitch dark out and following a good deal of snow, that the priest, who was dressed in black, decided to walk a few blocks to another Dominican parish to go to confession to a priest there. The sidewalk was very slippery. The priest, then in his thirty-third year of life, noticed as he was in the middle of crossing a street that a car was coming out of nowhere and turning the corner, heading directly at him at a good clip of speed. The street itself was very slippery. The priest believed that he was going to be killed, figuring that he would be hit by the car and thrown against the wall of a building across the street. Instinctively, therefore, the priest reached out his arm to brace himself against the impact of the car. At the mere touch of his fingers on the car, however, the vehicle, which was moving rapidly, stopped without skidding on the snow and ice. The priest was stunned as he looked at the driver, who was also stunned. Shaken up by the event, the priest immediately returned to Saint Catherine of Siena Priory to go to confession there. Bishop McKenna then stunned us when he asked us to join him in a prayer of thanksgiving to God for sparing his life fifty years before, that is, on February 14, 1960, the Feast of Saint Valentine. Bishop McKenna said that he had been living on what he called "borrowed time" ever since. Please join us in giving thanks to God that Bishop McKenna's life was spared on that day in 1960 so that he could add honor and glory to God at the altar and add grace to the world every time he offered the Holy Sacrifice of the Mass. We thank Our Blessed Lord and Saviour Jesus Christ and His Most Blessed Mother for being able to know, if only for a relatively short time, four years between January of 2007 and March of 2011, in comparison to those who knew him and worked with him for four decades, and to be taught by the Most Reverend Robert Fidelis McKenna, O.P., as we express our deep condolences to those who cared for him in his final years and to all those who considered him their spiritual father, a man who helped countless numbers of people to accept the true state of the Church Militant in this time of apostasy and betrayal. May his soul and all of the souls of the faithful departed, through the mercy of God, rest in peace. 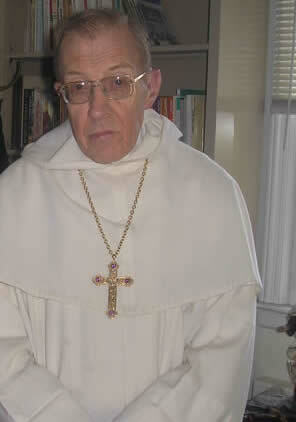 Our Lady of the Rosary, pray for +Bishop Robert Fidelis McKenna, O.P., R.I.P. As there are many hundreds of people with stories to relate about the late +Bishop Robert Fidelis McKenna, O.P., I have decided that the very brief reflection that was posted about twenty-four hours ago is sufficient for the moment. Words really cannot express the zeal that Bishop McKenna had for the salvation of souls or his deep and abiding life of prayer, which began early in the morning and would end rather late at night. Those who were privileged to know him, even for the short span of four years that we did, never ceased to be inspired by his tirelessness in the face of illness and vexation. One thing, however, that I do want to relate is the fact that we started praying for His Excellency as soon as I received word that he was near death, which was about an hour before he died on Wednesday, December 16, 2015, the Feast of Saint Eusebius and the Commemoration of Ember Wednesday in Advent. It was around twenty minutes before His Excellency died that we started to pray two sets of prayers for the dying from The Servite Manual of Prayers, Behold Thy Mother, intending to join those prayers with the clergy and religious who must have been gathered around his bedside while he was in his final agony. We finished those prayers at 1:10 p.m., Eastern Standard Time, five minutes before His Excellency died. Thus it is that I think that the best use of my limited time is provide you with the text of these prayers and to urge every reader of this site to purchase The Servite Manual: BEHOLD THY MOTHER: A Collection of Devotions Chiefly in Honor of OUR LADY OF SORROWS, published originally in 1947 by the Servite Fathers and republished by Refuge of Sinners Publishing, whose republication, with the permission of the Servite Fathers, by the Sentman and Gauvin families has been an important contribution to the interior lives of many people thus far. Please continue to pray for the repose of the soul of the late +Bishop Robert Fidelis McKenna, O.P., and for all those who knew and worked closely with him, both clergy, religious and members of the laity, over the course of the past forty years. I. O most holy Virgin, by the sorrow which transfixed they heart, when holy Simeon foretold the affliction thou wast to endure at the death of thy Divine Son, intercede for this person, now at the point of death, that his (her) heart may be pierced with true contrition. II. O most gracious Virgin, by the sorrow thou didst endure, to save thy Son Jesu from the persecution of Herod, thou wast forced to fly with Him into Egypt, deliver this soul from the snares of the infernal foe. III. O most afflicted Virgin, by the sorrow thou didst feel at losing thy Son Jesus, beg that this soul may not be lost, but may dwell for ever with Him in heaven. IV. O most distressed Virgin, by the sorrow thou didst feel at seeing thy Son Jesus carrying on His bruised shoulders His heavy cross, obtain for this departing soul grace to bear patiently, for the love for the love of thy dear Son, the cross of his (her) sufferings. V. O inconsolable Virgin, by the unspeakable sorrow thou didst experience at seeing thy Son Jesus crucified between two thieves, pray for this soul that sorrow for his (her) sins may pierce his (her) heart, as the nails pierced the hands and feet of our divine Lord, and the spear His sacred side. VI. O most desolate Virgin, by the sorrow thou didst feel in receiving into thine arms the dead body of thy Son Jesus, pray that this departing soul may be received into the eternal glory of heaven. VII. O Virgin most sorrowful, by the desolation thou didst feel, when, having accompanied thy Son to the sepulcher, thou hadst to part with Him, have pity on this soul, and accompany it in the great journey to eternity. Pray for him (her), most sorrowful Virgin. That he (she) may be worthy of the promises of Christ. GRANT, we beseech thee, O Lord Jesus Christ, that the most blessed Virgin Mary thy Mother, whose most holy soul was pierced with the sword of sorrow in the hour of Thy Passion, may intercede before the throne of Thy mercy for this Thy servant, now and the hour of his (her) death. Who livest and reignest, world without end. Amen. V. May the sorrowful Virgin Mary. I. O most holy Mary, by that fear and trembling which overwhelmed thine heart, when thou didst hear that thy beloved Son and our Lord Jesus Christ had been taken His enemies, abandoned by His disciples, and led to Caiaphas and Pilate, help, we implore thee, the soul of this person in its struggle, that he (she) may have a true sorrow and contrition for his (her) past sins. Comfort and strengthen him (her), that he (she) may not fear the coming of the common enemy, nor tremble at the sight of his (her) severe Judge, angry for his (her) sins, but may rather see Him, appeased by thy powerful prayers, show him (her) a merciful countenance. Amen. II. O most sweet Virgin Mary, Mother of God, by the cruel anguish which tortured thine heart, when the Jews cried out, “Crucify Him! crucify Him!” and Pilate delivered thy Son Jesus Christ to them to be crucified; hasten we entreat thee, to help this poor creature of God in this his (her) last struggle, because his (her) body is tormented with pains, and his (her) soul is in in distress on the one side through the attacks of the devils, and on the other through the dread of the strict account to be given to the Judge. Assist him (her), we beseech thee, most sweet Lady, that he (she) may not hear the sentence of eternal death pronounced against him (her), nor be delivered to the eternal flames, but may through thy intercession, obtain the joys of everlasting happiness. Amen. III. O most merciful Virgin, Mother of God, by that sword of sorrow which pierced thy most holy soul, when thou didst see thy Soon Jesus Christ our Lord raised upon the cross, pierced with nails, and covered with His own Blood; deign, O most holy Mother, to assist this creature of God, and show him (her) thy glorious countenance in his (her) last necessity; defend him (her) against the infernal serpent and all the snares of the evil spirits, and disperse all his (her) enemies in the holy name of thy Son Jesus Christ and by the power of His cross, that he (she) may, with thee and the blessed spirits, sing eternally the praises of his (her) Lord God, and render Him eternal thanks. Amen. 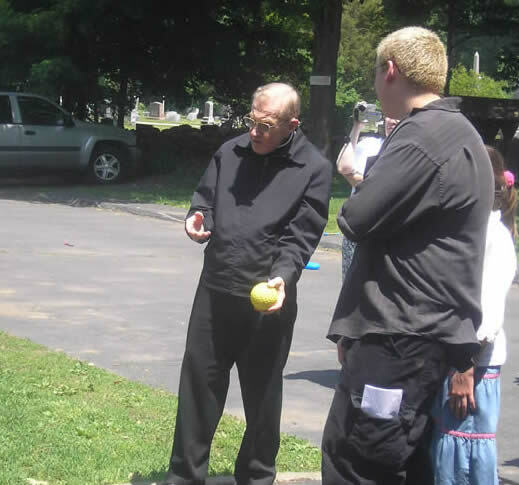 His Excellency Bishop Robert F. McKenna, O.P., winding up on June 6, 2008, to throw a ball at a target that would "dunk" a high school graduate. His Excellency, who used to pitch for his seminary baseball team (he talked about getting a bloop single off of a former pitcher for the New York Giants who was in the Dominican seminary), threw a perfect pitch to dunk the graduate of Saint Dominic Academy in Monroe, Connecticut. Not bad for a priest who had, 2008 observed his fiftieth anniversary of priestly ordination on June 5, 2008, the night before the graduation cermeony and celebration.